Scissett is a village in West Yorkshire, England. 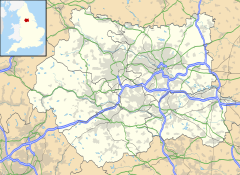 It is 14 km (8 mi) south east of Huddersfield and 16 km (10 mi) north west of Barnsley. According to the 2001 census, the village had a population of 1,324. Scissett is halfway between the villages of Clayton West, Skelmanthorpe and Denby Dale on the A636 road to Wakefield. River Dearne runs through the village, which was affected by the 2007 United Kingdom floods. Scissett grew up around the woollen industry in the 19th century as mill owners built houses in the area for their workers. The nearby coalfields also provided employment. These industries are now gone and some of the mills are now retail units. The Scissett Baths (and leisure centre) is one of the main attractions for the surrounding area. Scissett has first and middle schools to provide education for children ages 4 to 13. Scissett Youth Band began life in the village in 1978 but moved to Shelley Methodist Hall in 1991. Scissett is home to two sports clubs, Scissett Football Club and Nortonthorpe Cricket Club. Both play at Nortonthorpe sports club which was donated by the Norton family who owned the local mills at the time. When George Norton left the family home (Bagden Hall) to live in Nortonthorpe Hall he chose to outline a deed of trust, which specified that the seven and a half acres of land, which currently form the cricket and football pitch, could only be used for the recreational purposes of the community. This is largely the reason behind the cricket club being called Nortonthorpe instead of Scissett. The etymology is doubtful, although some sources suggest it may be from Old English side "hillside, talus, slope" (related to Old Norse siða, of similar meaning), but nothing is confirmed. The first element is uncertain. However, another source claims a completely different etymology, that it was named after "Scissett Wood", itself named after a woman. Wikimedia Commons has media related to Scissett. This page was last edited on 5 December 2018, at 03:22 (UTC).